I live in central Scotland & have been modelling for over thirty years, although in recent years have focussed on figure painting. Returned to kit-building this year. Getting married & having a baby boy has seriously impacted my hobby time, but he’s five years old now so I’m getting a little bit of time back. Plus of course introducing the wee man gently to modelling! Loving this site, there are some really talented modellers out there and thankyou for sharing your work. 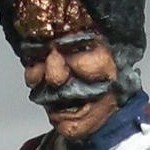 Most of my projects have been figure painting, particularly Napoleonic era so I understand not of much interest to members here – I’ve been lucky enough to have been sent test shots of figures from a US company called HaT so they can feature my painted figured on their website – so far the pinnacle of my modelling achievements! Will start posting some photos of my recent kits when I feel brave enough. Cheers guys.